A military judge is deliberating a sentence for Army Pfc. Bradley Manning in the WikiLeaks case, which will be announced Wednesday. 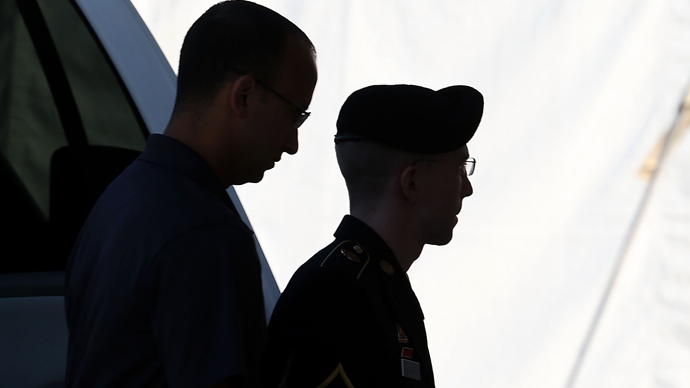 Manning faces up to 90 years in prison, with prosecutors asking for at least 60 years behind bars for the whistleblower. Col. Denise Lind, who on Tuesday began her deliberations in the court-martial near Baltimore, said she will announce the first sentence for Manning at 10am Wednesday morning (14:00 GMT). The sentence will be for the private’s disclosure of classified information through the anti-secrecy website WikiLeaks. 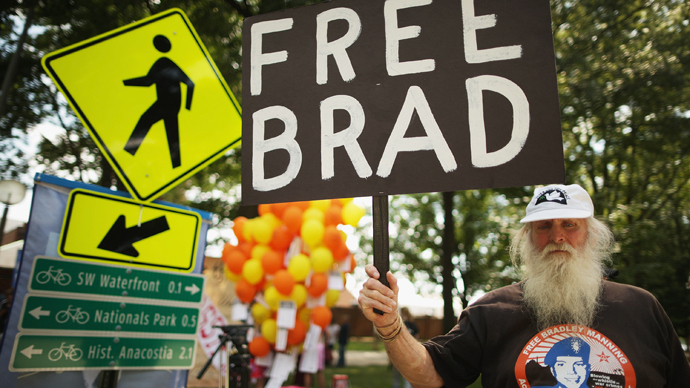 Bradley Manning has been in confinement for 1,293 days, as of today. This will be time served credit. Manning leaked a trove of Iraq and Afghanistan battlefield reports and State Department diplomatic cables in 2010 while working as an intelligence analyst in Iraq. The leaked files included the “Collateral Murder” video showing a US helicopter attack in Baghdad that killed at least nine people. Now the 25-year-old is facing up to 90 years in prison after he was convicted of 20 offences, including six violations of the Espionage Act, five counts of theft and computer fraud. While the prosecution has demanded the sentence be no less than 60 years. Manning’s defense said it should be no more than 25 and still insisted the private can be rehabilitated and should not "rot in jail." Manning has already been found not guilty on the most serious charge – aiding the enemy – which could have meant life in prison without parole. Defense attorney David Coombs, on the other hand, has described Manning’s actions as naïve, but well-intentioned. RT's Liz Whal who's been following the closing arguments of the sentencing hearing in Maryland says the defense has brought forward quite a number of extenuating circumstances to be considered by the judge. “These factors include Manning’s young age. He was 21 years old at the time he was deployed in Iraq. Manning’s troubled mental state was highlighted during the sentencing phase. Military mental health professionals testified that Manning suffered from anxiety and a gender identity crisis,” Whal said. 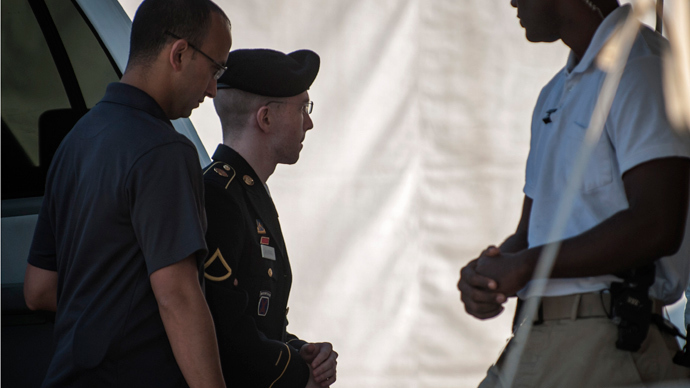 Manning himself has apologized for “hurting” his country, and pleaded with the judge for a chance to go to college and become a productive citizen. 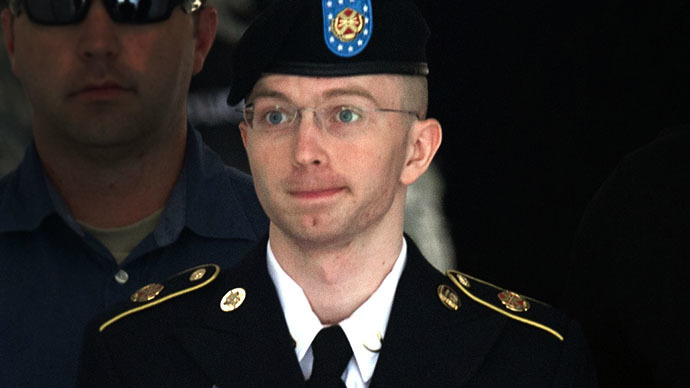 Wikileaks activist and blogger, Clark Stoeckly gave other reasons for the judge to be lenient in sentencing Manning, including the fact his whistleblowing did not do harm. “Barack Obama campaigned in 2008 on the promise to protect whistleblowers. And we’ve seen the complete reverse. Actually, we’ve seen Obama go after eight whistleblowers and so I think what will really have a big impact on the future chances of clemency or pardon will be winning the Nobel Peace prize. I think it’s very important that those who actually decide on the Nobel Prize winner take into account that over 100, 000 people have signed the petition for Bradley Manning. In the sentencing hearing we learned that there was no harm done by these leaks, no one was killed, no one was wounded. Several activists had to be moved around, but that was about it,” Stoeckly told RT. RT's Marina Portnaya went out on the streets of New York to find out it’s almost 50/50 when it comes to public attitude to Manning's disclosures, with some believing “he’s guilty and should go to jail” while others argue he shouldn’t be punished for something doing something really important for the country. 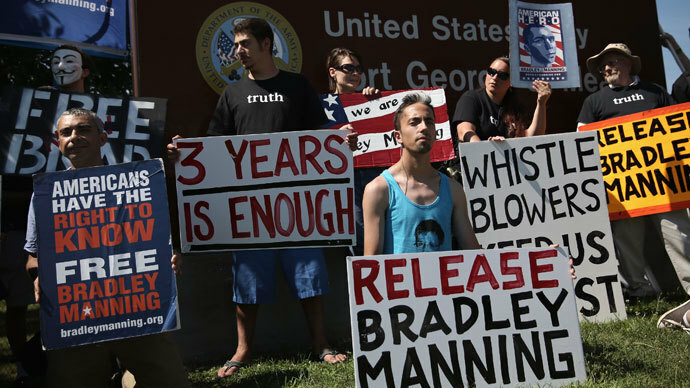 Many Americans appear to be in two minds over the Manning trial. “I definitely have mixed feelings, because I see the importance of national security. At the same time revealing war crimes is always an important thing also for just generally human rights. I’m really torn on the issue,” one of Portnaya’s respondents said. While Manning’s leak is certainly the biggest in US history, the country justice system has quite a record of dealing with whistleblowers. At the same time prosecution puts forward tough charges against them, they are being hailed as heroes by human rights activists. The pioneer of high profile leaks in US is Daniel Ellsberg, who in 1969 gave confidential documents about the Vietnam war to the New York Times and the Washington Post. He became the very first person to be prosecuted under the Espionage Act. The so-called Pentagon papers revealed that the US had been drastically expanding military operations in Vietnam and therefore successive administrations openly lied to the public about their true intentions. Ellsberg was acquitted in 1973. Former Senior executive at the NSA, Thomas Drake was also charged under the Espionage Act in 2010 for having leaked classified documents to the Baltimore Sun. He claimed that if the NSA used their resources more effectively, it could have prevented the September 11 attacks that killed thousands of Americans and triggered the subsequent invasions of Afghanistan and Iraq. Drake was sentenced to one year of probation and community service, as a result of a deal with the prosecution in 2011. Former CIA official John Kiriakou faced up to 30 years in prison after he was charged by the government in 2012 for leaking classified information to the press. He was the very first CIA official to publicly confirm and detail the Bush administration’s use of water boarding. While the charges against him, filed under the Espionage Act, were dropped as part of a deal, he is currently serving two and a half years in jail for his actions. The US administration of Barack Obama has prosecuted more government officials for alleged leaks under Espionage Act than all of his predecessors combined. This has raised concerns that future whistleblowers of government fraud and abuse will probably think twice before speaking out.